Watching SportsCentury on ESPN or a biographical program on Muhammad Ali, it's easy to get overwhelmed by Howard Cosell's erudition, his pointed opinions, his seeming opposition to all that defines modern commentating's aggressive blandness, gutlessness and obliteration of anything that might rise above the widest appeal. At moments like that, he cries out like the last voice in a gathering darkness of unintelligence. Listening to those few historic snippets, you can't imagine how anyone would prefer Joe Buck and Troy Aikman over him. Reading his book I Never Played the Game, however, instantly reminds you how — like the Yankees, Joe Morgan and AIDS — he aligned millions of strangers against him and how his adherents are often justly pilloried as the dangerously misinformed, cruel or insane. Despite the obvious intelligence and insights behind it, and despite a co-writer, the book is almost undiluted Cosell — and often in the most toxic boring form. I Never Played the Game has part of its heart in the right place. Having made his bones as a lawyer and then by working up the ladder of local radio and television broadcasts, Cosell approached sports as an outsider — or, at least, as a man as far outside sports as one can be while still becoming part of billion-dollar athletic and media empires. He writes the book with something like the distant perspective with which he began his career. Unfortunately, at his late stage in life, that distance takes the form of the bitter look over the shoulder from the kid who took his ball and went home. Cosell's perspective isn't so much chosen as enforced by his own need to excoriate the wrongs and wrongheaded people he sees. He's outside because either no one will have him, or because he will have no one. This presents a problem, because invariably he is at once both right and unbearable. For example, Cosell's dissection of the Giants' and Jets' ownership groups and their duplicitous and predatory dealings with the states of New York and New Jersey persuades and enlightens with ease. Both explanations and arguments converge with even greater force on Al Davis' move of the Oakland Raiders to Los Angeles. All three effortlessly detail the fundamental illegality of the NFL's exemption status with congress (as well as congress' ignorance and spinelessness in the face of the NFL), its ownership and rule structure and its legal machinations. Put simply: Cosell crucifies the shallow venalities and backbreaking and tortured juridical logic of a massive media conglomerate that acts with impunity and disregard for both its own fans and own government. Long before BaseballProspectus mathematically defined it, Cosell outlined how owners screwed cities, counties and states in favor of enormously profitable new stadiums whose rewards would not be shared by the taxpayers who funded them. However, he does all this through the lens of Howard Cosell, making every yin of slashing legal insight come hand in hand with a yang of self-serving bluster about what kind of no-mortal-could-afford-this steak he abandoned on the dinner table while allegedly storming away from a multimillionaire owner. Just at the moment you feel completely edified and versed in the inherent illegalities of NFL behavior, you likewise feel exhausted for having slogged through so much hedonistic muck. The direst evidence for this phenomenon comes in passages addressing Monday Night Football, both during and after Cosell's tenure on the show. To call it a look back in anger doesn't do it justice, because it's clear that there's no point in the timeline at which Cosell could look without some sense of injustice and sarcasm. He ducks and swings like a boxer, leaning back into victimization while jabbing viciously the next second. About everything. Obviously, he can't quite make up his mind. At different moments, he says that MNF would have been better with just Gifford and him, that he and Meredith got along famously alone, that Gifford was a drag on the show, that the three of them created an alchemy that could not be duplicated, that Meredith was always unprepared and a drag on the show, etc. The only story he gets straight through the entirety of his vituperative score settling is that nothing worked without him. Again, he's both right and unbearable about this. Cosell inveighs against the looming (now established and ineradicable) "jockocracy" of sports commentating. When he began announcing, the NFL and MLB did not yet put a full premium on ex-ballplayers offering "insights." The average announcer booth was just as apt to feature two professional announcers who'd honed their craft for decades as it was to feature an announcer paired with a recently retired player. What Cosell correctly saw was a gradually increasing preference for "authentic" insight from former players who, due to verbal ineptitude, often offered no insights at all. Worse, because of their sense of entitlement due to having played the game, they were often immune to any sense of their own shortcomings. In ensuing decades, Joe Morgan has risen to the apotheosis of this kind of creature: someone so proud of his on-field accomplishments that he simply cannot process how little they inform his understanding of a game he's watching and how little they can obscure his want of understanding of everything unrelated to himself. Yet in making this point, Cosell sabotages himself. It would be all too easy for him to lampoon the streetwise or country-fed ignorance of a bunch of jocks' puffing their chests out and pretending they understood communication, but Cosell makes the same errors from the other side of the spectrum. So obviously convinced of his gifts at communicating ideas, he little realizes how overbearingly and unattractively he relates them, how often he repeats himself and how often he subjugates the story to "the story as he lived and experienced it." Just as a twit ex-running back like Frank Gifford (still) can't really appreciate the game beyond an imaginative one-dimensional extension of his own experience, Cosell's enumeration of sports playing and sports programming begins and ends with his ability to imagine the roles of those around him as played by Howard Cosell. Doubtless much of the blame falls on how the book was written. Though Cosell and Peter Bonaventure share co-author credits, the book unmistakably reads as the grammared-up transcripts of Cosell's talking into a microphone. The repetitions give it away immediately as the written circumlocution of a man working back again to the same points from auditory and not printed memory. In a way, this somewhat forgives his penchant for preening detail. Vain though he certainly was, you get the sense that those details about pricey steaks and decorous dining tables speak less to his desire to make himself look important than to their being mental cues for where things happened, when they happened and what happened next. All of us can pinpoint a specific Christmas with the family because of a burnt roast or a baby barfing on our shirts faster than we can do so by the year or the topic of conversation. Cosell merely has the luxury of being able to differentiate moments by, well, their specific trappings of luxury. Regardless, even a forgiving reading can't rescue the book as a whole. Cosell might trigger memories because of an exceptional prime rib in an exceptional restaurant, but minor shortcomings like that aren't enough to drown salient points. 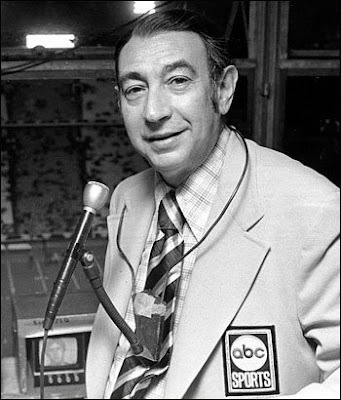 Only Cosell's egotism possesses the relentless drive necessary to overcome insight with vanity. Though his condemnation of the now-confirmed "jockocracy" still warrants applause, and though he details the shameful illegality and greed of the NFL and its owners, those laudably intelligent observations contribute far less to the book than his own narcissism. Twenty-five years ago, I Never Played the Game offered a proud and prickly indictment of the self-glorifying jock culture and the increasingly self-styling and manufactured glamor of American sports. At the time, it probably merited something like a free pass, given that it came from someone outside the games themselves. Today, however, to distinguish it in any meaningful way from any announcer or player's self-touting autobiographies would involve fruitless hair-splitting. By artificially claiming to stand outside a game and a media empire he then thoroughly inserted himself in, Cosell cynically laid a reverse blueprint for every player bio that begins deep inside the game and then artificially attempts to step away from it and comment without self-aggrandizement. Both templates are specious; both are "written" by someone else; both are untruthful; both are unpleasant to read. Entertaining for a period in NFL history that reflects on today's mercenary management practices but otherwise tedious and unrewarding. Cosell's opinions on boxing have far more weight, but most readers will be challenged to get to those chapters. Recommended for historians of broadcasting or boxing. Recommendation to avoid for anyone but the most die-hard of that group.